As the most populous country on the African continent, the Republic of Nigeria is known as the “Giant of Africa.” Its diverse landscapes and climatic conditions, including rainforest, coastal plains, mangroves and vast savannah, account for Nigeria’s wide biodiversity of flora and fauna, including abundant species of snakes. Among them are several venomous ones: the West African carpet viper, gaboon viper, puff adder and black-necked spitting cobra. Primarily nocturnal, the West African carpet viper (Echis ocellatus) is 1 to 2 feet long with speckled light to dark brown dorsal scales and a light-colored belly. A sidewinder, it lifts its upper body, braces its head and pulls the remaining coils along without touching the ground at an angle. It ranges throughout Nigeria in its natural habitat of forest edges and savannah, up to 3,000 feet above sea level. The carpet viper accounts for 90 percent of the snake bites in Nigeria, and 60 percent of human snakebite fatalities -- mostly farmers and young children, according to the Medical Journal of Therapeutics. The carpet viper’s breeding season coincides with heavy rainfall during the annual monsoon season, driving it to seek shelter in higher, drier habitats to lay eggs. Farmers, most of whom harvest crops by hand, are at high risk from these aggressive snakes, whose potent hemotoxic venom make it the most dangerous snake in all Africa and, in terms of morbidity and mortality, the most dangerous snake in the world. Victims experience blistering, swelling, hemorrhaging and tissue damage that may result in necrosis. Ranging throughout the tropical rainforests and other moist regions of East and West Central Africa, the terrestrial gaboon viper (Bitis gabonica) hunts for rodents, birds and frogs during the evening hours. A heavy snake, it ranges from 4 to 6 feet and its brown color and leaf-shaped head provide excellent camouflage under leaves on the forest floor. Viviparous, the gaboon viper gives birth to 30 to 60 live young. Infamous for having the longest fangs among snakes, up to 2 inches, the gaboon viper is responsible for several snakebites in Nigeria each year; its potent venom is deadly to humans, if not treated promptly. The puff adder (Bitis arietans) is distributed throughout North Africa. Non-aggressive and sluggish, it's responsible for 60 percent of reported snake bites, making it one of the most dangerous snakes on the continent. Its potent venom is cytotoxic and injected by front-hinged fangs that fold out when the mouth opens and retract when it closes, like a switchblade knife. Human victims of their bite will die if not treated within 26 hours, or deep necrosis may set in, requiring amputation of the affected body part. Adult puff adders generally reach about 3 feet long with dull yellow, orange, brown and beige markings providing excellent camouflage. Preferring open grassland, savannah, open woodlands and rocky outcrops, they prey upon rodents and birds. Displaying a characteristic open hood, the black-necked spitting cobra (Naja nigricollis) spits when provoked. It's a highly venomous snake responsible for many human bites and fatalities every year in its range from Nigeria to Namibia. 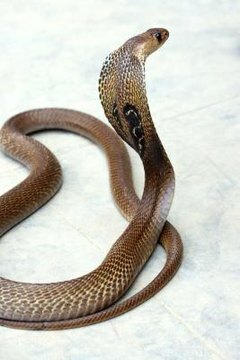 This olive-brown snake with the black back and a yellow to red underbelly has a broad, dark-colored throat band. It's nocturnal and preys on toads, lizards, grasshoppers and rodents. Females grow up to 6 feet and males are about 4.5 feet long. Females lay 10 to 20 eggs (oviparous) each breeding season. In Nigeria, many snakes are difficult to identify; both poisonous or non-poisonous species meet with certain death if they crawl near human habitation. Due to the high incidence of snakebites, many farmers raise pigs, which are immune to snakebites, to clear the land of snakes. Deforestation, mistaken identity and a taste for snake meat have all had a negative impact on the non-venomous snake population in the region, including those species that are useful to humans by keeping rodent populations in check.